Smith and Wesson 17 terméket találtam. 12 1/8" overall. 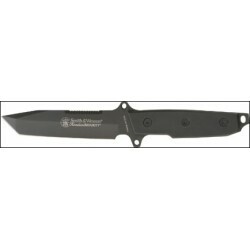 7 1/8" black coated stainless blade with sawback. 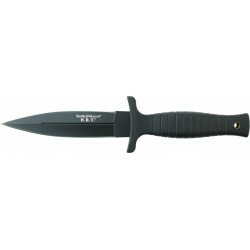 Black thermoplastic handle with black finish stainless guard. 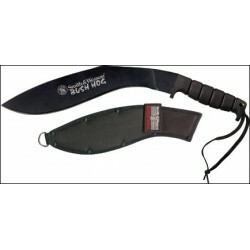 Black heavy duty thermoplastic and nylon scabbard taht works with knife as a wire cutter. MOLLE compatible. 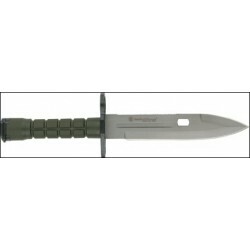 HRT Military Boot Knife - 7 3/8" overall. 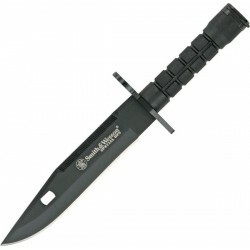 3 1/2" black powder coated stainless false edge dagger blade. Black rubberized handle. Lanyard hole. Black molded composition boot clip sheath. 9 1/8" overall. 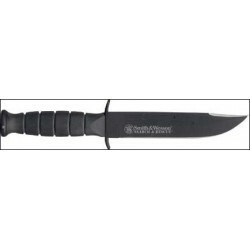 4 3/4" black powder coated tanto blade. Black rubberized handle. Lanyard hole. Black leather boot clip sheath. 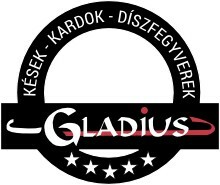 SW HRT csizmakés, dobókés bőr tokkal Teljes hossz. : 23 cm. penge hossz. : 12cm. súly: 116 gr.HRT Boot Knife - 9 1/8" overall. 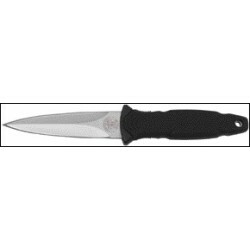 4 7/8" black finish stainless double edge blade. 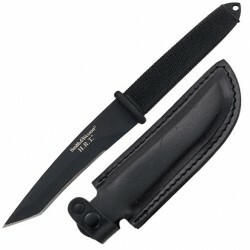 Black rubberized handle with lanyard hole. Black leather belt/boot clip sheath. S&W Search & Rescue Marine Combat. 10 3/8" overall. 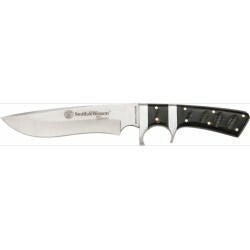 5 7/8" black powder coated 440C stainless recurve style blade with "Search & Rescue" and Smith & Wesson logo etching. Grooved black rubberized aluminum handle. Black finish guard and pommel. Heavy black Cordura belt sheath with hardshell liner and stone pocket. Taktikai tőr Teljes hossz: 10,3/8"440C Rm. pengegumirozott markolatCordura tokkal élezőkővel. S&W Search & Rescue Tanto. 10 1/2" overall. 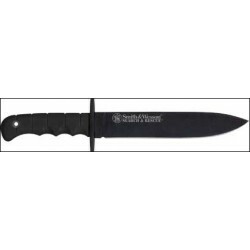 6" black powder coated 440 stainless tanto blade with "Search & Rescue" and Smith & Wesson logo etching. Grooved black rubberized aluminum handle. Black finish guard and pommel. Heavy black Cordura belt sheath with hardshell liner and stone pocket. SW2BK Bajonett12,1,/8" teljes hossz.7 1/8" penge hossz.Thermoplastic makolatThermoplastic tok cordura betéttel. MOLLE kompatibilis.